PPV has a fully conjugated backbone (figure 1), as a consequence the HOMO (exp link remember 6th form!) of the macromolecule stretches across the entire chain, this kind of situation is ideal for the transport of charge; in simple terms, electrons can simply "hop" from one π orbital to the next since they are all linked. Figure 1: A demonstration of the full conjugation of π electrons in PPV. The delocalised π electron clouds are coloured yellow. PPV is a semiconductor. Semiconductors are so called because they have conductivity that is midway between that of a conductor and an insulator. While conductors such as copper conduct electricity with little to no energy (in this case potential difference or voltage) required to "kick-start" a current, insulators such as glass require huge amounts of energy to conduct a current. Semi-conductors require modest amounts of energy in order to carry a current, and are used in technologies such as transistors, microchips and LEDs. Band theory is used to explain the semi-conductance of PPV, see figure 2. In a diatomic molecule, a molecular orbital (MO) diagram can be drawn showing a single HOMO and LUMO, corresponding to a low energy π orbital and a high energy π* orbital. This is simple enough, however, every time an atom is added to the molecule a further MO is added to the MO diagram. Thus for a PPV chain which consists of ~1300 atoms involved in conjugation, the LUMOs and HOMOs will be so numerous as to be effectively continuous, this results in two bands, a valence band (HOMOs, π orbitals) and a conduction band (LUMOs, π* orbitals). They are separated by a band gap which is typically 0-10eV (check) and depends on the type of material. PPV has a band gap of 2.2eV (exp eV). The valence band is filled with all the π electrons in the chain, and thus is entirely filled, while the conduction band, being made up of empty π* orbitals (the LUMOs) is entirely empty). Figure 2: A series of orbital diagrams. A single atom has one atomic obital. A diatomic molecule has a bonding and an anti-bonding orbital, two atomic orbitals gives two molecular orbitals. The electrons arrange themselves following, Auf Bau and the Pauli Principle. A triatomic molecule has three molecular orbitals, as before one bonding, one anti-bonding, and in addition one non-bonding orbital. Four atomic orbitals give four molecular orbitals. Many atoms results in so many closely spaced orbitals that they are effectively continuous and non-quantum. The orbital sets are called bands. In this case the bands are separated by a band gap, and thus the substance is either an insulator or a semi-conductor. In order for PPV to carry a charge, the charge carriers (e.g. electrons) must be given enough energy to "jump" this barrier - to proceed from the valence band to the conduction band where they are free to ride the PPV chain’s empty LUMOs. It is already apparent that conduction in polymers is not similar to that of metals and inorganic conductors, however there is more to this story! First we need to imagine a conventional diode system, i.e. PPV sandwiched between an electron injector (or cathode), and an anode. The electron injector needs to inject electrons of sufficient energy to exceed the band gap, the anode operates by removing electrons from the polymer and consequently leaving regions of positive charge called holes. The anode is consequently referred to as the hole injector. 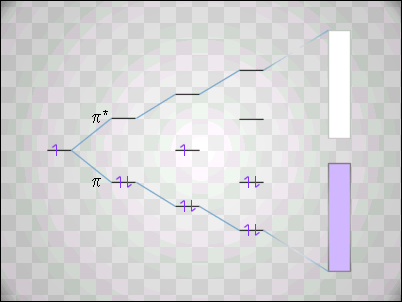 In this model, holes and electrons are referred to as charge carriers, both are free to traverse the PPV chains and as a result will come into contact. It is logical for an electron to fill a hole when the opportunity is presented and they are said to capture one another. The capture of oppositely charged carriers is referred to as recombination. When captured, an electron and a hole form neutral-bound excited states (termed excitons) that quickly decay and produce a photon up to 25% of the time, 75% of the time, decay produces only heat, this is due to the the possible multiplicities of the exciton. The frequency of the photon is tied to the band-gap of the polymer; PPV has a band-gap of 2.2eV, which corresponds to yellow-green light. Not all conducting polymers fluoresce, polyacetylene, one of the first conducting-polymers to be discovered was found to fluoresce at extremely low levels of intensity. Excitons are still captured and still decay, however they mostly decay to release heat. This is what you may have expected since electrical resistance in most conductors causes the conductor to become hot. Capture is essential for a current to be sustained. Without capture the charge densities of holes and electrons would build up, quickly preventing any injection of charge carriers. In effect no current would flow. Go to The Development of LEPs..